Just a small and crappy update: While my enthusiasm's had a shot in the arm since someone told me how to disassemble PRiD Magnus more easily (his giant cab backpack is easier to remove than expected), I am way too broke to order test shots of anything right now untile I settle into having a regular paycheque again. So, naturally, I started retrofitting my Magnus parts to work with Fansproject's Steel Core (who was a lovely gift from someone who has posted in this very thread, and has nothing to do with my being broke!). 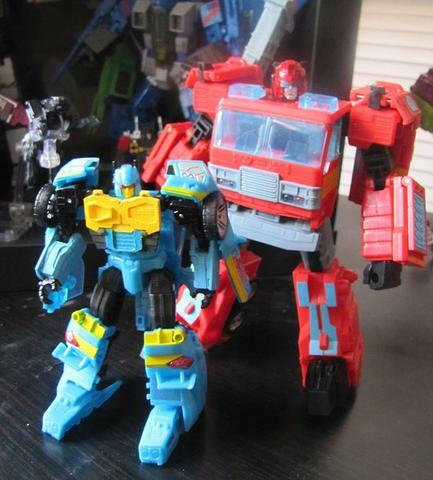 So I now plan on releasing conversion packs for a MtMtE style Magnus for three different Voyager toys. Apparently I just reeeeeeeeeally love me some Magnus. Motto: ""Give me a piece of break" - my 3 year old son"
Just a quick update. I finally painted the rotor, so here is a good detail picture. Once again, I highly recommend it. Currently searching for Cybertron Supreme Starscream & G2 Go-Bots Megatron, Complete at good prices. PM if you can help please. Wow, this stuff looks amazing GlauG. I can't wait to see how this progresses. You can definitely sign me up for the Thunderclash add-ons. It looks perfect. An update? From me? Amazing. Got myself a super-cheap iGear "Tubes" and wanted to do justice to one of my favourite tragic MtMtE characters. Ended up having a day off sick from work and nothing better to do, and this head happened. I'll work on a new torso sometime, but since the regular toy doesn't resemble the MtMtE design too much anyway I don't feel too bad about it. Been more than a little busy lately, but https://www.shapeways.com/model/1786876/quot-mtmte-quot-strong-stumpy-robot-parts.html MtMtE Brawn's up for sale on Shapeways, if anybody feels brave enough to test him, I haven't had time nor funding lately but the design has been sat completed for over half a year now... You'll need a Beast Hunters Deluxe Bulkhead for him, but those should still be fairly easy to find I hope? Made a Nightbeast chest for the Generations toy. More IDW than G1, but that's what all the kids want nowadays right? dammit GlauG, these look amazing. My money is burning in my pocket, when will i be able to buy this stuff? Darth Zax wrote: dammit GlauG, these look amazing. Most of it is for sale now, any particular items you were asking about? The Nightbeat chest had some errors, so I took it down until I fixed them. A general announcement: Shapeways are changing their pricing structure either midnight tonight or sometime tomorrow (they say "On October 7th"), so that "sets" which consist of multiple parts will become more expensive, but single pieces will become cheaper... I will be making "sprues" so that all my multi-part sets count as a single piece, but it will take time, I didn't get round to finishing it over the weekend sadly. Anyone who wants the MtMtE Brawn set or the Generations G2 Dreadwing set (for example), I recommend either ordering today if you can't wait for me to amend the models. Very quickly, the Sleuthing Robot chest 1.1 has a small error so it sits slightly too high on the toy. However, if you've bought one, I think I've got an idea to sort the issue out, but I'll probably be unable to do anything about it until after the weekend. Okay, with the assistance of the very helpful David Willis and Clayton Shackelford, I believe I've now ironed out all the kinks this piece previously had. Courtesey of Mr Willis, that's the Ver 1.1 with the "collar" sanded down, and some paint applied. I've been bouncing around ideas on how to make Generations BB taller anyway, mostly for the sake of Nightbeat, and hit on this: It's a neck extension. Crucially, it will make Nightbeat's head taller than the collar on the Ver 1.1 chestpieces, so I present it as an option for anyone who doesn't like the idea of modding parts. What's Holmes without his Watson? Nightbeat's obnoxious chum Siren can be better represented with this chest for the same Generations Bumblebee mould. Or, if you prefer, you can use it on your $100+ MilPub Goshooter. I'm not sure how much interest there actually is in this, but I want one for myself and that's enough reason to make it! It certainly beats my earlier plan of totally redesigning the joints for Energon Wheeljack. Quick question Glaug; can you explain to me how your mounts for Dreadwing's...wings...is supposed to work? Assemble both mounts as I've illustrated with the one here. The red part slides into the groove in the wings that's greated by sliding the panels open for gun mode. The orange part slides onto the main fuselage piece, the "spine" of the robot mode, and grips by friction, with the 5mm peg facing outwards. Then you just adjust the mounts so that the wings have enough clearance from the rest of the toy. I hope that helps? Yeah, ok. I had figured the base gripped onto the spine, but couldn't figure ut how to get thewings on. Thanks! Shapeways had a lovely offer on over the weekend where you got 20% off your own prints, so naturally I took advantage... Due to how WSF print charges are now worked out, the actual model I prepared looks a little like the mess above! It does mean that in about 2 weeks I'll finally have my own prints of all my designs to paint up and share, with the exception of my HeavyTread-to-Brawl set, which I didn't have time to add, sadly. Plus, I've set it to "print it anyway" to test out the sprues I've used, so fingers crossed it all holds up. Worth pointing out that there's currently a 20% sale on ALL models on Shapeways today as a Cyber Monday offer with the code CYBER20. This naturally includes mine. Still waiting for prints of my last few models. For now, just a teaser for an upcoming project. This stuff looks pretty amazing! I have Blender and I'm hoping to make some stuff to sell on ShapeWwys myself- I already have an idea for a figure I could make. 1: I know the Shapeways guys will fix imperfections/errors in 3D models if the model you send them isn't quite right (so if there's a small gap in the mesh); what are they prepared to fix and what will simply get the model rejected (I assume they'll tell you why it was rejected though)? So for example, if a model isn't quite manifold due to a few minor oversights, will they be prepared to fix that error? 2: Do multipart models have to be printed on a sprue? So could I just send them a model of, say, a simple figure with the parts separated (I know I couldn't send it with it "assembled" as it would end up printed fused) or would I have to model it onto a sprue? 3: Can NURBS surfaces be used in models for printing? Delta Magnus wrote: This stuff looks pretty amazing! I have Blender and I'm hoping to make some stuff to sell on ShapeWwys myself- I already have an idea for a figure I could make. Thanks! I'm far from the most experienced TF CAD modeller, but I'll do my best to answer. They will only assist with extraordinarily minor fixes, and I've had things not print correctly due to mesh gaps I missed before. You can force things to print as test prints for yourself, but you can't set a model for sale that way to the public. They are, however, extremely good about pointhing out what any errors are... Usually with annotated renders. Delta Magnus wrote: 2: Do multipart models have to be printed on a sprue? So could I just send them a model of, say, a simple figure with the parts separated (I know I couldn't send it with it "assembled" as it would end up printed fused) or would I have to model it onto a sprue? 3 months ago, the answer was no. As of early October, they changed the price structure on the cheapest (and strongest) material so that now they charge per individual part... Several people like myself, Wulongti and Fakebuster had sets triple in price, which was absurd. Sprued, they now work out slightly cheaper than they were before October, but the amount of effort involved is very frustrating, especially as they keep moving the goalposts regarding sprues... However, see my image below for an example of what can still print. Delta Magnus wrote: 3: Can NURBS surfaces be used in models for printing? Can you export an STL from a model using NURBS? I'm a very old-fashioned poly/vertice modeller who's entirely self taught from a mis-spent time in highschool making Quake mods, so I can't helpfully answer there I'm afraid. Despite all the complaints from Shapeways about sprued parts breaking recently, somehow this massive bundle managed to print in one piece! Finally got to see this in-hand for myself. Overall, very pleased. The neck extension needs some work but I like the overall look. He even still transforms, although the panels at the front of the car have a very small gap. He looks taller than BB in person, but the photo doesn't really show it. Another MtMtE-style mod I've had sitting on the back burner for nearly a year now is this guy! 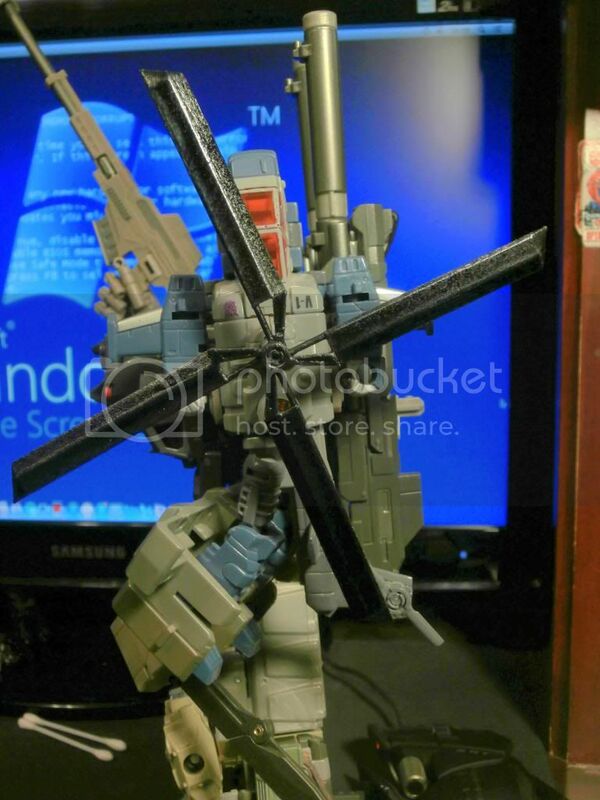 He looks like a cross between his MtMtE design and Cloud Brawn, which I can live with. Need to edit his model in a few places though before he goes back on sale. Nautica fans should consider investing in a BH Deluxe Starscream. Let me know once you've had a chance to try out the wing mounts for Dredwing. I'm still having rouble getting it on; I'm probably missing something insanely simple. Hope those help. The problem is that the "clip" is slightly too thick to slot into the groove as intended, but they do nicely fit into the part of the wings pictured. Hey, that actually looks better I think, than the original way. Thanks! This is one that's been sat around for ages too, like Brawn... Extremely happy with how it's come out, while the ball is a little loose in the neck that's an easy fix. Now that's a good idea. I like it! 4,334 pages were recently viewed by 763 unique visitors. This page was viewed 1 times on Saturday, April 20th 2019 3:47am CDT. © 2019 Seibertron, Inc. DBA Seibertron.com. All Rights Reserved. Established June 2000. Seibertron.com is owned by Ryan Yzquierdo.